This post launches a new blog series on world religions, which I gave a short introduction to here. We’re kicking it off with Zoroastrianism, one of the world’s oldest religions. 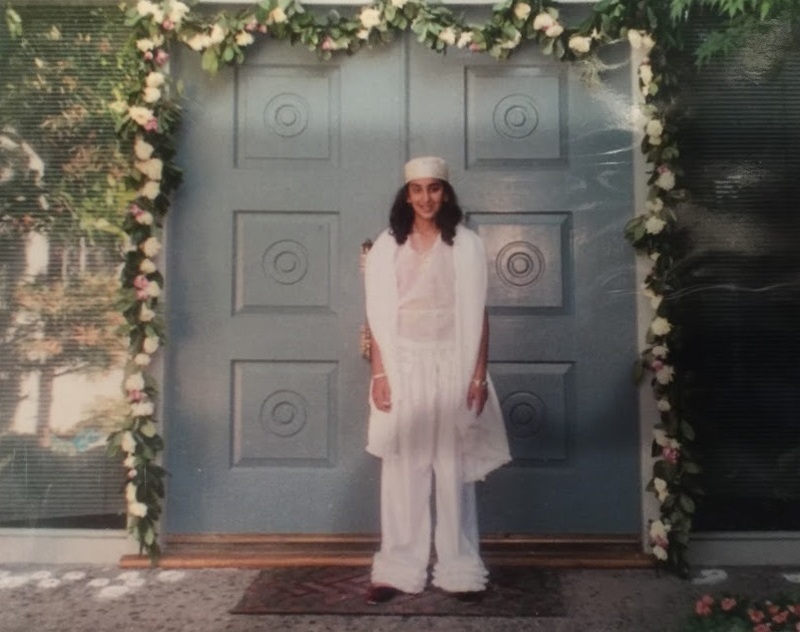 This post will be unique from the others because I interviewed two Zoroastrian sisters to compile the following interview. It’s a double dose of wonderful! Shaheen: I’m a dermatologist. 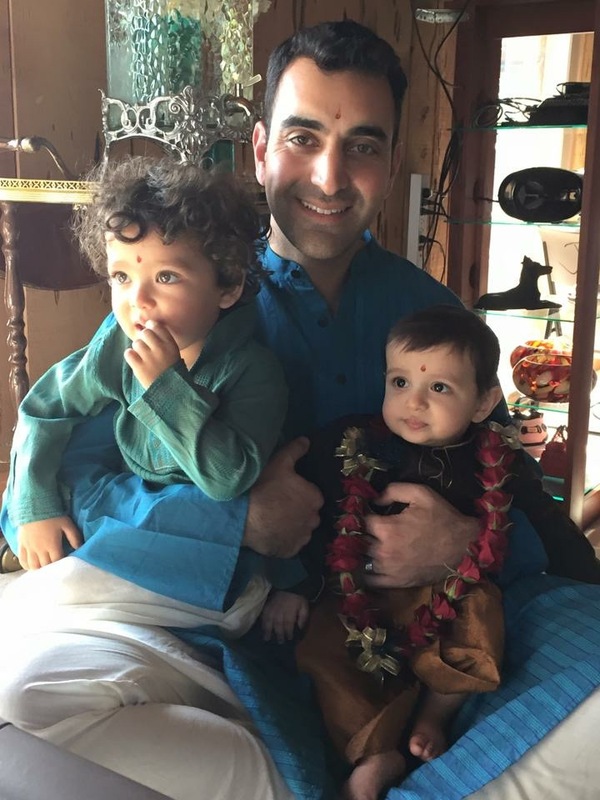 Married, with two young children, living in Menlo Park, California. 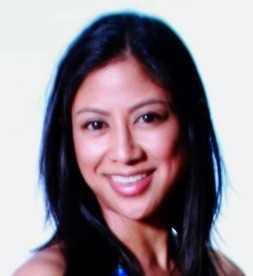 Monisha: I am originally from Stockton, California. I currently live in San Francisco. I am the youngest of three children and my parents both immigrated from India in 1971. I’ve just graduated from law school. Why are you Zoroastrian? Was the religion passed down? Did you discover it? 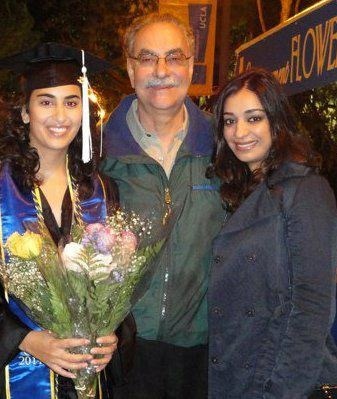 Monisha: I am Zoroastrian because my father is Zoroastrian. The religion nowadays is patrilineal, meaning it is passed down through the father. One cannot convert to Zoroastrianism. This practice makes Zoroastrianism a “closed religion,” and as a result the religion is dying out. This has resulted in some controversy in the Zoroastrian church because one of the things we Zoroastrians like to boast about is that Zoroastrianism, from the beginning apparently, all those thousands of years ago, promoted equality between men and women. By the way, I am told this constantly by my Zoroastrian elders and I still don’t know what this means. Did women in ancient Iran have the right to vote? The right to choose? Equal pay? What does it mean to be Zoroastrian? What is unique about the faith? Shaheen: Zoroastrianism is the oldest monotheistic religion. To be Zoroastrian we must think good thoughts, say good words and practice good deeds. Monisha: Our religion is unique because it is so small and yet so very, very old (Zoroastrianism has possible routes dating back to the second millennium BCE and enters recorded history in the 5th century BCE). On a more personal level, I find my religion unique because, according to teachings, I must practice good thoughts, good words, and good deeds not only to save my own soul but to save humanity. In Zoroastranism, there is God (only one) and there is the devil. Zoroastrianism diverges from other religions who have God and the devil because it is not clear that God will prevail in the end! Uh-oh. What do we do? In Zoroastrianism, each individual is a soldier of God, and it is our personal responsibility to practice good thoughts, good words, and good deeds in order to help God prevail against the devil in the battle of good versus evil. This has led some scholars to consider Zoroastrianism a dualistic religion with two deities rather than a monotheistic religion, because at the moment, both God and the devil seem equally powerful. But we Zoroastrians tend to think of our religion as monotheistic because we only worship God; we do not worship the devil. Tell me about practices / religious holidays. Is there a temple or religious structure? Shaheen: Fire Temple in Zoroastrianism is the place of worship for Zoroastrians, often called dar-e mehr (Persian). In the Zoroastrian religion, fire together with clean water, are agents of ritual purity. Tower of Silence: After death, Zoroastrians are laid on the earth in the tower of silence where vulchers fly above and consume dead bodies. It is the circle of life. Monisha: There is a religious structure called a fire temple. I believe there are also religious holidays but we never celebrated them at home. Don’t feel too bad for me; we celebrated Hindu holidays because my mom is Hindu. This is fine for Zoroastrians because Zoroastrians believe in respecting all religions. In terms of practices, we are supposed to say our prayers every day and wear a special white shirt called a sudreh and a garter that we tie three times around our waste (to remind us of good thoughts, good words, and good deeds) called a kusti. I wore these for a little while after my navjot, or induction into the religion, but have not worn them since. I do regularly say my prayers before exams, though. Pros – because it’s a very small religion, about 250,000 or less in the entire world, Zoroastrians stick together. We help each other. We know each other. It’s automatic friendship. Cons – the religion is dying because we cannot convert others and it must be passed down from the father. It’s a closed religion. A big pro of being Zoroastrian is that I feel special. People meet me and treat me like some rare historic artifact. A big con is that our religion is so small that I did not and could not grow up attending religious services or feel like I was part of a Zoroastrian community. I didn’t know about Zoroastrian until I met you. 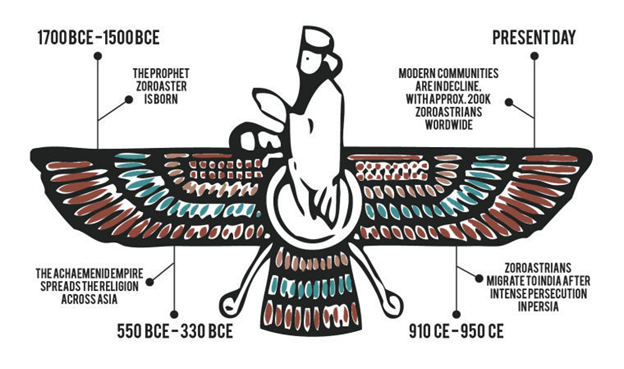 In fact, I still don’t know anyone else who is Zoroastrian. Why do you think that is? Monisha: Zoroastrianism is a closed religion, and in order to be Zoroastrian, your father has to be Zoroastrian. But it was not always that way. Zoroastrianism became a closed religion when Arab Muslims invaded Iran in the 7th Century C.E. and to avoid persecution, many Zoroastrians fled to India. These Zoroastrians, who eventually became known as Parsees, were granted asylum in India on the condition that they would not try to spread their religion. This resulted in a diverging sect of Zoroastrianism, because Indian-Zoroastrians (Parsees) and Iranian Zoroastrians (like Shaheen and me) practice Zoroastrianism a little bit differently. 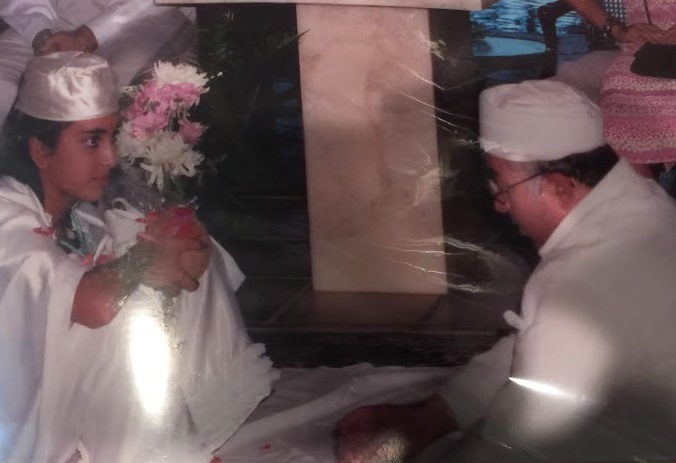 Parsees have incorporated a lot of Hindu customs in their faith and they pronounce their prayers a little differently than Iranian Zoroastrians. Shaheen: No because my husband is Hindu, he is not Zoroastrian. Monisha: Well technically no. Because I do not plan to marry a member of our tiny religious population, I do not plan on passing the religion down to my future children. But in another sense, I believe that passing down my religion will be inevitable to some extent, even if my future children do not call themselves Zoroastrian. The moral philosophy I will teach them will be Zoroastrian because it is what I know. When I think of teaching them how to live moral lives the phrase “good thoughts, good words, and good deeds” comes to mind. Shaheen: After death we are judged and either go to heaven (light) or hell (darkness) very similar to Christianity. Shaheen: When I was 8 years old and my brother was 7 years old we had our navjote’s in India. Navjote means “new birth.” We were accepted into the Zoroastrian faith. We had to learn and recite prayers with a priest on stage in front of hundreds of people. Monisha: I’m not really that religious, I’m afraid. I haven’t had a moment when I felt like God spoke to me or I felt enlightened. I think I see my Zoroastrian identity as more cultural and ancestral than spiritual. Shaheen: It has not. I bet President Trump doesn’t even know what Zoroastrianism is! Monisha: It is possible that the three magi or kings that followed the star of Bethlehem and gave the baby Jesus gifts were Zoroastrian priests! Have you ever been to Iran? Since the religion originated there, do you know what percentage of Persians are Zorastrian? Or can you estimate? Shaheen: Never been to Iran. All Iranians were Zoroastrian at one time. Now there are only around 250,000 left in the whole world, including Parsees and Iranian Zoroastrians. 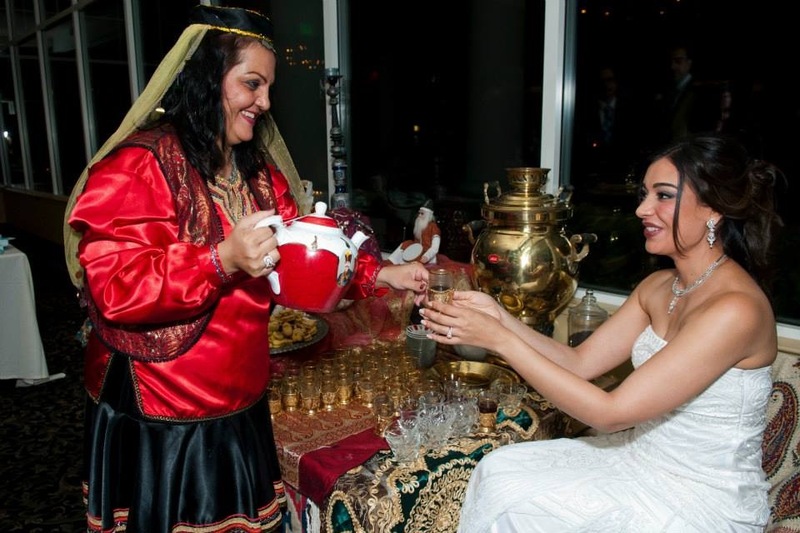 Shaheen, even though you married a Hindu, were there any Zoroastrian customs or traditions that you incorporated into your wedding? Shaheen: We had a second wedding that was Zoroastrian but was only a blessing since we couldn’t do the whole ceremony since Rohit is not Zoroastrian. I randomly learned recently that Freddie Mercury was Zoroastrian. Do you know anyone else? Monisha: That’s right! I believe Freddy Mercury was Parsee! But I am told that he was not a very good Zoroastrian, meaning that he did not embrace his faith or his heritage. I couldn’t think of any other famous Zoroastrians off the top of my head (that are living anyway) but I looked on google and found this https://en.wikipedia.org/wiki/List_of_Zoroastrians. Additionally, there are some famous Zoroastrians from history such as Cyrus the Great, Xerxes, and Darius, all ancient emperors of the Persian empire. Monisha: Yes. My favorite Zoroastrian text is the very first prayer that we learn. It is called “Ashem Vohu” and is written in the Zoroastrian religious text, called Avesta. Both Parsees and Iranian Zoroastrians say this prayer but pronounce it slightly differently. There are many different translations of this prayer but this is what I believe it to mean. It probably is not the most accurate translation, but it is the one I like best because it is the translation I learned as a child. Truth is the best good and it is happiness. Happiness (is) to him, who (is) truthful for the sake of truth. Thank you so much Monisha and Shaheen for the background on Zoroastrianism. I really enjoyed hearing about your religion! You can find Shaheen online at the following link. The last link is to a Zoroastrianism documentary with Morgan Freeman. Very interesting. Thanks for doing this. I know I will find it interesting. This was really cool and I learned a lot. Thank you for sharing about this religion as I truly never heard of it before this and learned so much here today, because of your beautiful and thoughtful interview. Thank you for the article. As a Zoroastrian myself it’s nice to read about it and hear others talking about it occasionally. I am curious Catherine about Shaheens & Monisha’s belief that there children cant be Zoroastrians or have their Navjote done. My mother is a Parsi and Dad a Hindu but I consider myself a Zoroastrian. Many children of mixed marriages do have their Navjote done. I’ve never heard the term “closed religion” – that does make it difficult to sustain a religion, particularly with so many marriages of mixed faiths. Thank you for teaching me something new!